I had my first taste of piaya in high school back in the early 80s. 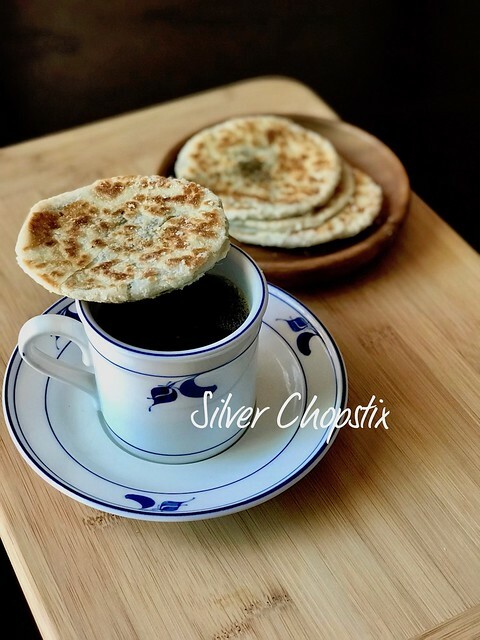 Piaya is best described as a flatbread or some would say pastry filled with muscovado sugar. Back then this sweet delicacy is hard to come by in Manila. Someone would have to bring it to you all the way from Negros. Negros a province in the Visayas region is known as the “Sugar Bowl of the Philippines” since majority of the sugar plantation in the country can be found here. That is why it’s not surprising that the most delectable local sweets and delicacies originated here. Fast forward to present day, piaya is now readily available in local groceries not only in Manila but other parts of the country as well. 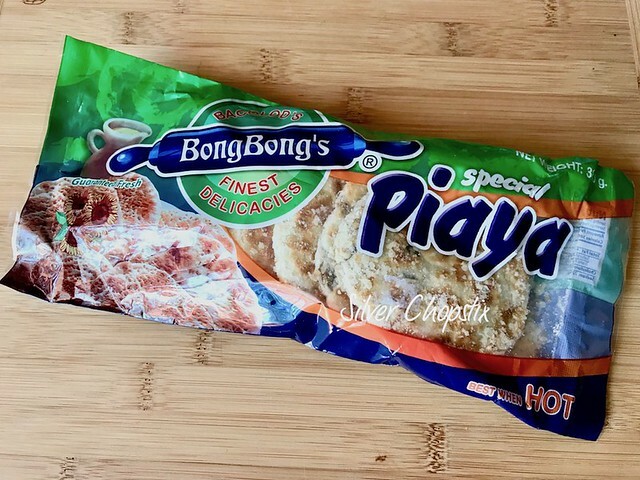 One of the most famous manufacturer of piaya is Bong Bong’s. My sister recommended this to me during my grocery shopping trip in Manila. She said that this so popular that sometimes the store would run out as soon as it’s placed on the shelves. Lucky for me I was able to purchase a couple that time. Back here in NJ, I decided to make a dessert out of it. 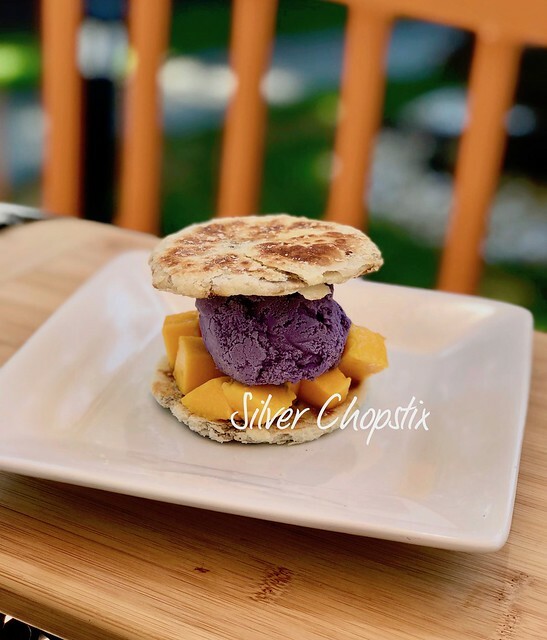 It’s so simple really, it’s just putting together three ingredients: piaya, mangoes and ice cream of your choice. First, slice and dice some ripe mangoes. 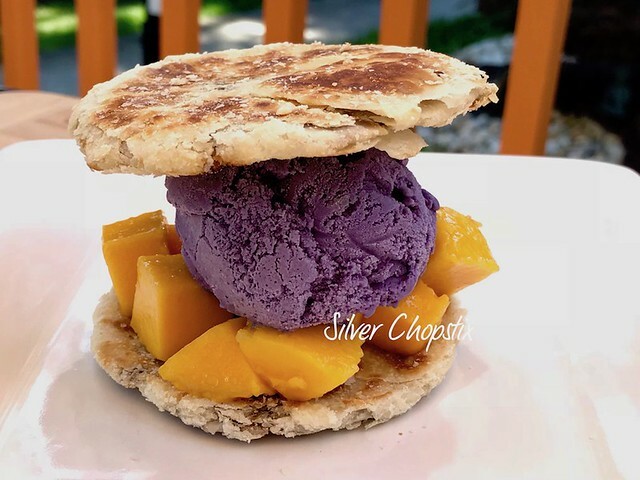 Place a piece of piaya on your plate, add some dices mangoes and top with a scoop of Ube ice cream (I chose ube to make it more Filipino) then place another piaya on top. 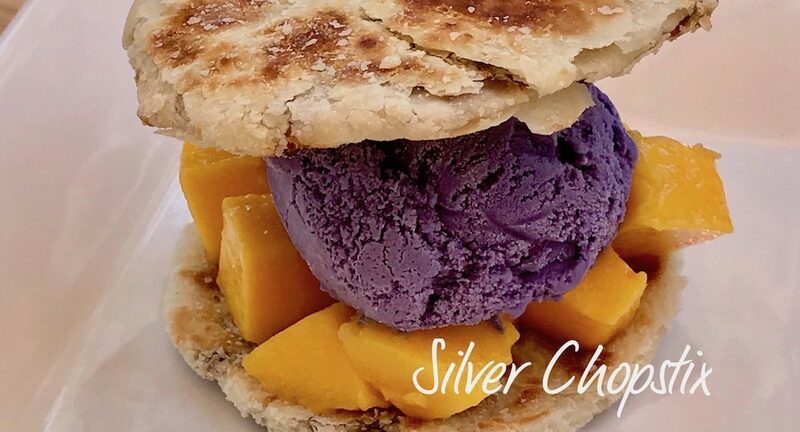 You can drizzle some melted chocolate on top or latik (coco jam) for a truly decadent dessert. You can also pair it with coffee or tea, I assure you it’s truly addicting.